Gary John Boyd was the last of six children born to James Chester and Annie Hugh Hudson Boyd. And the only boy. He married his high school sweetheart, Susan Elaine Johnson in May of 1974. They had my sister, Lindsey, in 1980 and me 3 years later. 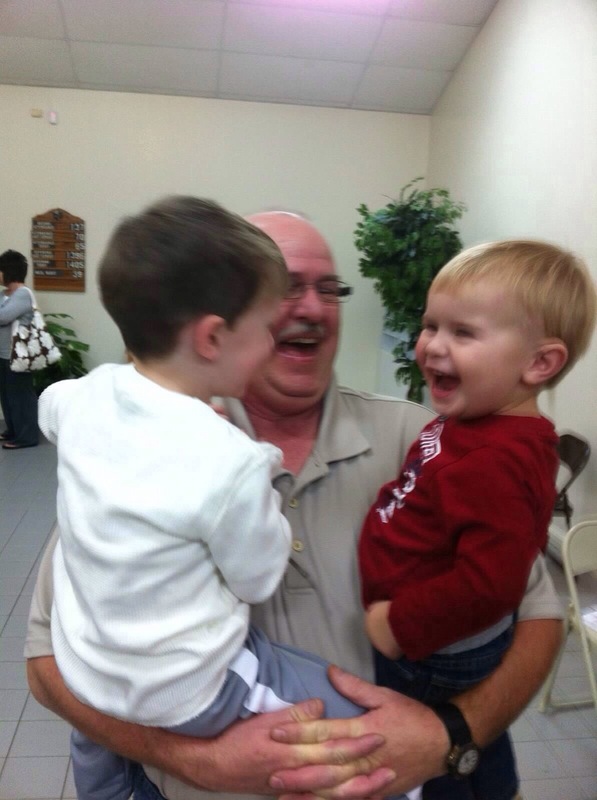 Then finally he got two sons-in-law and later two grandsons that totally rocked his world. I’ll get to all that later. I have heard stories about Daddy’s childhood my whole life. A lot of them are hilarious and most all of them mischievous. Like the time he kept wadding up my aunt’s doll clothes she was ironing. When she caught him, she stuck the hot iron right to his chest. He’d laugh so hard when he told that one. And I’m sure I’d have you in stitches if I could tell those stories like he did. That was one of Daddy’s many talents. He could tell a story like nobody’s business. Another talent was sports. Daddy was a natural born athlete. I have seen him walk out on a softball field 50+ years old, not having played in over a year, knock the daylights out of the ball and run crazy fast (well as fast as his short legs would go) for a triple. Not many 20 somethings could do that with time to practice. The baseball coaches in our small town fought over him when he was little. Brownfield and Walnut both tried to claim him. One of his little league coaches, we saw recently, said that they finally made the rule that if you lived past Harmony Baptist Church you were Brownfield property. And Daddy did. But baseball wasn’t even his sport. Nope. Our daddy was a quarterback. In fact he was “Tippah County’s most prolific passer” according to a Tippah County sports history book. Sean Smith, sports writer for Southern Sentinel in 2008, wrote “I had the opportunity to interview Gary Boyd, considered the best pure passer to play at Walnut High School and in Tippah County.” Our daddy, “Walnut’s southpaw quarterback”, threw 64 touchdowns for Walnut from 1968-1970. 11 his sophomore year, 28 his junior year, and 25 his senior year. He threw 6 in one game, nobody else has done that at WHS since. I never knew that growing up. I mean, I knew Daddy was a quarterback, and that Walnut had a good team those years. He told us about the bowl games, and about the time Coach Gullett put them back on the bus at half-time during a game they were losing and threatened to take them back home if they didn’t start playing. He bragged about the teams. The records. So much so that we’d run to the other room and ask Mama if he was telling the truth. As a Wildcat cheerleader and the quarterback’s girlfriend, she’d had a front row seat. But he never told us how many touchdowns he threw or anything like that. I learned that from the 2008 article and from people I would see out in town. They would ask if I was Gary Boyd’s daughter and before I could even get out my response they were telling me what a good football player he was. How they wanted to be like him when they were growing up or how much they enjoyed playing with him. I wished they had had film back then. I would have loved to see him play. Daddy shared his love of football with us. 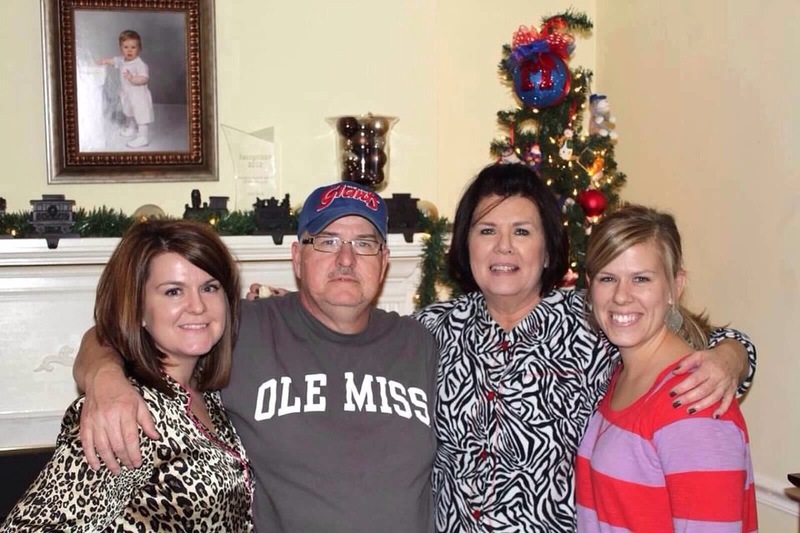 Like all good Southerners do, he and Mama raised us up as Ole Miss Rebels. Saturdays in the Fall you could find us huddled around the tv or radio, Lindsey and I with our pompoms and Walnut footballs that we caught at the homecoming games. If Ole Miss was playing well, we had to keep our seats. If not, we did a seat shuffle for luck. One time I was upside down in the recliner for some reason (I’m sure it made sense to the 10 year old me), and we scored. Daddy made me stay there until the Rebels turned the ball over. We kept that tradition going. The football watching and the seat shuffling. I don’t think there were very many games that we didn’t all watch together whether at home or in the Vaught. 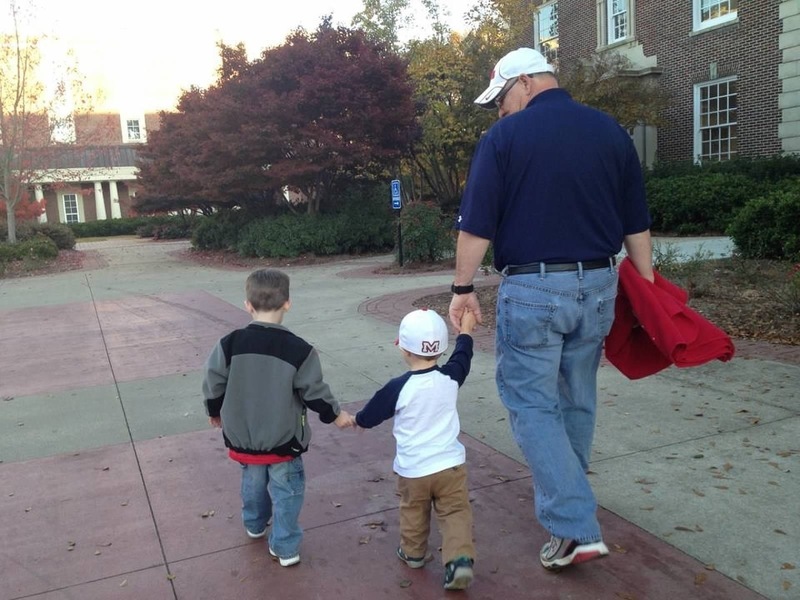 Daddy loved Ole Miss, but he wasn’t obnoxious about it to other fans no matter what they said to him. He could get along with anybody. Even a Bulldog. In fact, at the funeral this guy came by to pay his respects, and he had on this really nice Ole Miss tie. A lot of people were honoring Daddy by wearing red and blue. I commented that I liked his tie and he said that he and Daddy had many debates on Ole Miss and Mississippi State. He was a Bulldog. “True Maroon” (or whatever), but that morning he had gone over to his neighbor’s house and asked to borrow an Ole Miss tie to wear for Daddy. I thought that spoke volumes about Daddy and him. I mean, I wouldn’t wear maroon and white for just anybody. But that’s how Daddy was. Everybody liked him. I wish I could remember all the things people said to us about him at the hospital and after. There were so many people Daddy touched. The hospital waiting room at times was absolutely full of co-workers, family, church family, and friends. People sent pictures of his co-workers holding hands, in prayer for our Daddy. The whole plant. Praying for him. That meant a lot, especially in today’s world. One of our church members came up to us at the visitation and said that the parking lot was spilling over, people were having to park on the side of the highway. They were walking up Highway 72 on a cold February night to honor their friend. Back to the grandsons. I have never seen a grown man act so crazy just to get a smile out of his boys. He’d try just about anything to get them tickled. He’d tell them, “whatever you do, don’t you pull my mustache!” Sawyer and Hudson would just about knock one another down to get to him. As soon as they’d pull it he’d scream, “yeeeoooww!” and those boys (Daddy included) would just about pass out from laughter. Mama and Daddy would get them on Friday nights and Mama would send me pictures of them parked in front of the window waiting for G to get home from work. When they would see his truck turn in, they’d squeal and hide in the tent for him to find them. I know they miss him, but he left them a pretty good legacy to be proud of. They recently named the street by the football field after Daddy, Gary Boyd Pass. Hudson calls it G Pass. And I know as they grow up and hear more stories about G, they will appreciate that sign even more. There are so many things I’ve left out about Daddy. How he always said his name really fast, GaryBoyd. And how his family all called him GaryJohn (said equally as fast). How he’d stand a song book up on its end and prop his elbow on it at church. How he sang This World is not My Home and To Canaan’s Land I’m on My Way. How he loved our Boyd Bash in June. Working in the yard in the Spring. Driving that blue tractor. And planning Shane’s Saturdays for him. He loved setting fires, big ones. Riding the boys on the golf cart and in his white pick up if it was cold outside. He loved that Kevin converted from Mississippi State. That Lindsey is a teacher (he always said it was a noble profession). He loved Christmas decorations. His recliner. That I liked doing taxes with him. And He loved Mama. I am still so hurt. And shocked that my daddy isn’t here anymore. It’s a feeling that you really can’t describe. You hear this all the time, but you just don’t know until you’ve been there. And even then it’s different for everybody. But I am thankful for God’s grace and mercy. I am thankful that though my heart is broken. I have the hope of seeing him again. That our God is so awesome, Daddy might even be able to still see his boys. And his girls. But that if he can’t, he is still experiencing something so amazing that we can’t even imagine it! 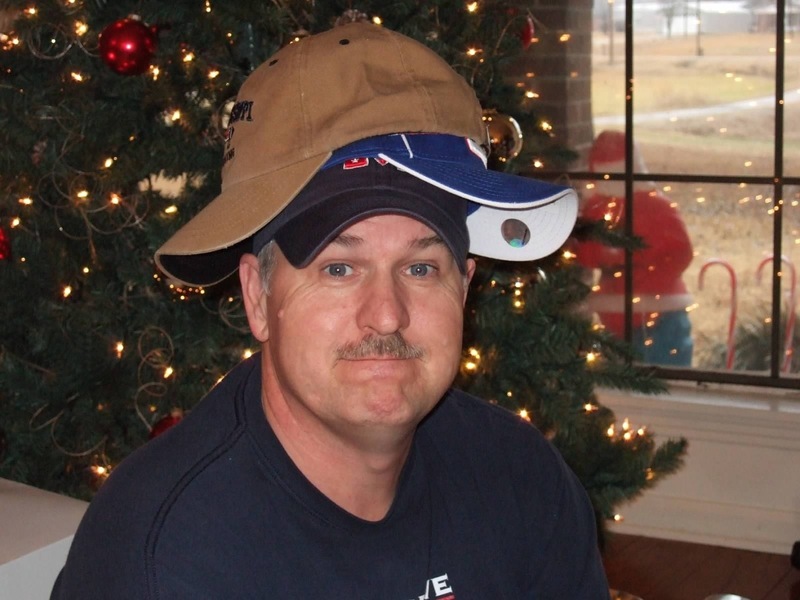 And I know I’m biased, but I’m pretty sure he was the best daddy this old world has ever seen. That was so beautifully written, Haley! Your dad was certainly a special man. I only was around him a handful of times, but he was someone I instantly liked because he was so genuinely kind. I loved reading all of that about him! What a legacy he has left! That was beautiful. Your dad was one of the kindest men I had ever met. He and i worked together at the Walnut plant. I never met him in that plant that he didn’t speak to me and ask how are you today. Even when I got laid off and was working at Exxon he didn’t forget who i was he would still say speak to me and ask how things were going. He was definately a great ball player and a great Godly man. My heart goes out to your family. Thank you for those sweet words! U r so rite 2 think of your dad as being a GREAT MAN because he was. I have never heard Gary say not one bad word 2 anyone or about anyone. I cried when I read this only because ur dad lives on through u kids & grandkids. I know everyone that worked with him would say the same, a verry SPECIAL PERSON ALWAYS & I still can’t believe he is gone,heaven is alot better place with him in it. Mr. Gary was a wonderful man. He taught me so much. I worked with him at the Walnut plant for several years. I was so sad to hear of his passing. God truly blessed your family with Mr. Gary. I am truly blessed to have known him. Thank you! He was pretty special! What a great Tribute to your Dad! I don’t recall ever going to a football game at Walnut when he wasn’t there. I’m sure he’s smiling now looking down on you guys! Great read! You are so right Haley, everyone loved you dad. He was a all around GREAT guy. Kind to everyone. You could see in his how eyes and his smile just how much he loved his family and loved life. Donald worked with him at Walnut and was always talking about Gary Boyd and his stories. Thanks for sharing the stories. Thank you! I’m sure his co-workers have some good stories on him too! Thanks Rich! I could write for years on fires! Haha! Oh wow! Thank you for those sweet words! I can remember riding to Horn Lake with him on a Saturday to deliver parts for a job! Gary is missed by all who knew him. 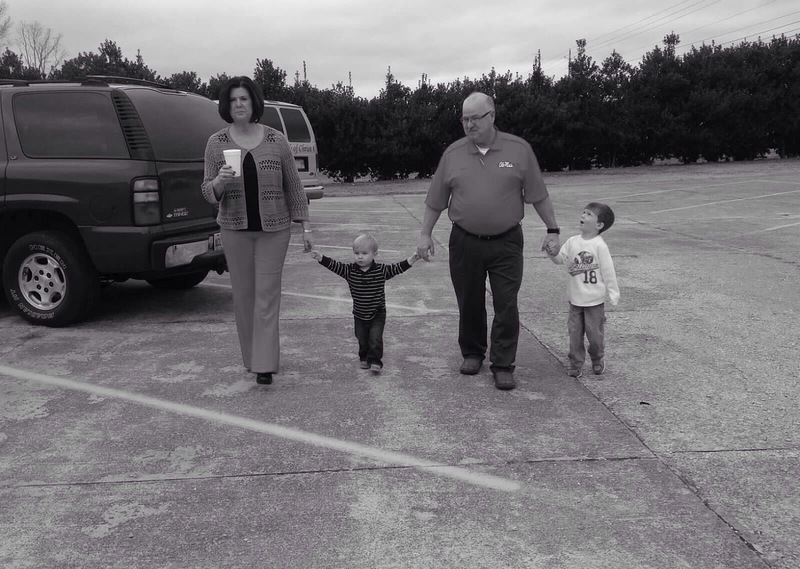 He was a wonderful example of father, coworker, husband, grandfather, and Christian. Hugs and prayers for you all. How is Susan doing? Thank you so much!! She’s doing well. These grandsons keep her busy! A very good honest Christain man, a natural leader went to NEMJC with him and 29 + years at Dover/Thyssen-Krupp , never hear a bad word, or saw him angry. Thank you so much for you kind words about our Daddy! It’s always nice to hear them! And just like that, Kindergarten. Want to know when I post a new blog? Enter your email and click the follow button below. My life as a stay at home, homeschooling mom.